Computer_Geek, formerly known as Mod-Geek, joined Hattrick on Jan. 15, 2009. He got his team, Saigon Geeks, on Jan. 20, 2009 and started to manage the team competitively since then. He became moderator of Việt Nam since Aug. 02, 2009. He have also been in LA team since Sep. 25, 2009. He resigned the job on Sept. 13, 2010 and the alias was changed back to Computer_Geek. On Sep. 25, 2009, he officially became a Language Administrator to help on improvements the newly added Vietnamese language and other local matters. He resigned the job on Sep. 13, 2010. On Jan. 05, 2010, he was elected as U-20 coach in Việt Nam during the U-20 World Cup XIV term. He is the first coach to lead U-20 Việt Nam team advance to World Cup. He is also the first coach to lead a Vietnamese national team (NT/U-20) advance to Round III and Round IV (quarter-final). U-20 Việt Nam was ranked 9/124 after U-20 World Cup XIV with 675 rating points. 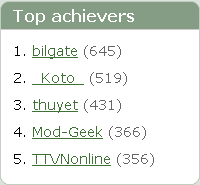 Besides managing his team competitively, Mod-Geek is also working on his Hattrick achievements. The following table shows his current achievements. On Nov. 24, 2009, he was listed on top 5 achievers in Việt Nam. This page was last edited on 30 May 2014, at 01:38.